The sun is shining and its going to be a beautiful day, time to drag out the summer clothes and find out what fits. Need to do some alterations, some upcycling, me and my homemade gingerbread and lots of tea will be at the club to set up the cafe from 12.30-3.30, any sewing questions? come along and have a chat. For my first day I am having a little competition, leave a comment and I will draw a winner to win a bag. The cafe sounds wonderful, I wish I were closer. 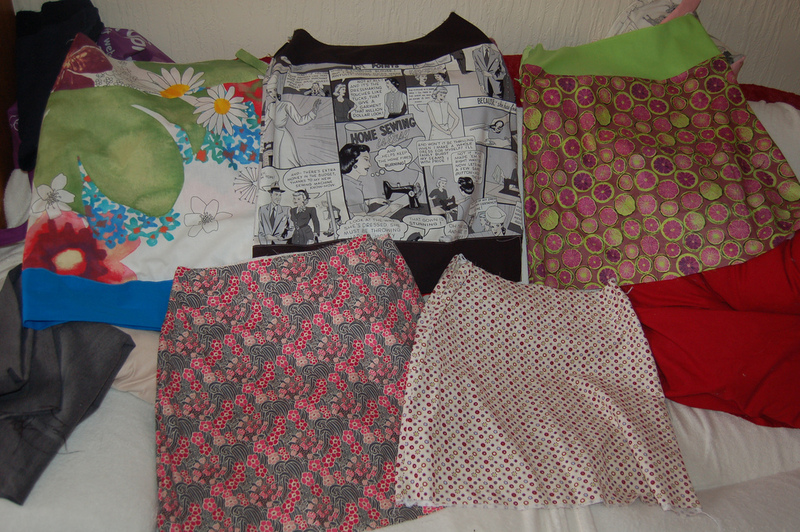 Wish I was nearer, have fabric, have machine, just no idea what to do with them! Good Luck! I am so excited for you Yve. Fantastic Yve, just the kind of thing so many people need. I’m forever telling my friends that they can take up a hem!! P’raps we should have a UKarma trip out to see you? You have worked so hard to get Cafe Create up and running – you deserve the success that I am sure it will bring. Cosy days with good company, tea, cake, sewing and knitting – what could be better? Will be dropping by soon…. Wish I lived near you – it sounds like my kind of place! Wishing you huge amounts of success! Can’t wait for your shop to be open again , I love the things you make . Wish I lived closer too. oh that top middle skirt is adorable! If only I was 20 years younger! Good luck with your shop etc 🙂 you know I love your stuff! You are doing a fab job, the cakes sound delicious too! I love the comic strip fabric! P.S. The comic strip fabric is awesome, as is the grapefruit print – yummy! Yay! I’m needing more project bags! Teehee everyone is going to read that midle skirt! LOL CUUUTE!! Love the vintage charm! Now, where is the gingerbread recipe??? Beginner with new starter machine. Practicing and cannot figure out what it is I am doing wrong. Trying a simple straight stitch. Machine is jamming up with thread on bottom side of fabric. It is thread from needle, not bobbin. I have changed needle and increased tension, it is not helping. Could you have a possible solution? Hi Cindy, a few things may cause this, are the bobbin thread and the top thread the same? is the bobbin in the right way round? is the machine threaded properly, is the needle in the right way round?